With arbitration filings coming up and settlements flying in, today would be a good day to examine the early returns on arbitration eligible players. Many teams appeared to believe that arbitrators would not be giving the same type of discounts versus free agent rates as they have in recent years, given the rules of arbitration combined with the struggling economy. Now, with some numbers in, we can evaluate that claim. 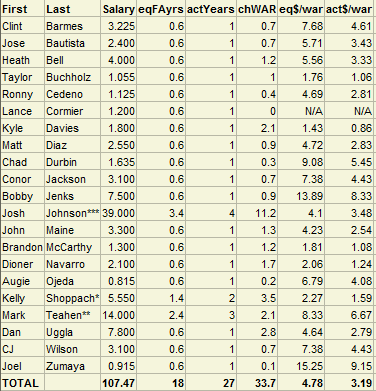 Following are tables showing the settled salaries for arb-eligible players as of Monday night. For reference, “eqFAyrs” are the equivalent free agent years purchased in this contract. Arbitration in the past has tended to award 40% of FA market value in year 1, 60% in year 2, and 80% in year 3. So for third-year eligible players, a one-year contract is buying .8 equivalent free agent years, or eqFAyrs. The column “actYrs” simply shows the actual amount of years the contract covers. The “chWAR” field is WAR as projected by CHONE. Finally, we have “eq$/war,” which is $/war with the discount factored in, and “act$/war,” which is just salary divided by projected WAR. Each * after a player’s name means they were signed to a multi-year deal, with as many extra years as *s present. Here are the third-year arbitration eligible players. No major surprises here. 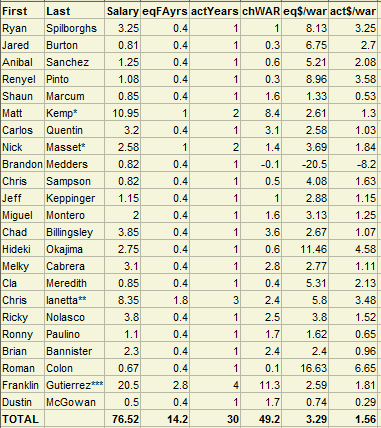 There are some overpays (Heilman, Santiago), and some good deals (Gaudin, Gerut, De La Rosa, Correia). 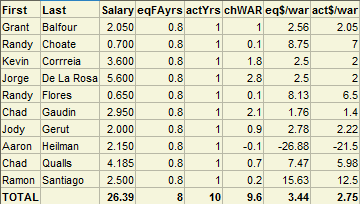 Overall, this market is very much in line with the overall free agent market, which is hovering somewhere between $3.5M and $4.0M per marginal win, as shown by the 3.44 eq$/WAR total for this group. At 2.75 act$/WAR, this group is still a good discount. The second-year arbitration eligible market is more interesting. Even looking at act$/WAR here, this group is hardly even a discount, at 3.2M. This group is seeing the type of raise that we would have expected without the economic collapse – a raise from $4.4M/WAR in 2009 to $4.8M/WAR in 2010 would have followed normal trends. These players are overall slightly better than the third-year arb group, but not by a significant amount. It appears that these players are either getting raises or are having their salaries stay constant as a result of high arbitration rewards in the 2009 offseason, and the arbitration rules are making the process less of a discount for the teams. Finally, we have the first-year arbitration players. This group is more in line with the free agent market and the third-year arbitration eligible group. As this group does not have any high arbitration rewards to serve as a lower bound for next year’s salary, this seems to follow. These players are generally a fantastic deal, coming in overall at only $1.58M per marginal win, somewhere near 40% of their free agent market value, as expected. So far, we’ve seen two groups act as expected and the second-year arbitration eligible players showing up as a bit of a market irregularity. It will be interesting to see if this is corrected when arbitration hearings and settlements are complete, and it will be interesting to see if the other groups remain as they are as we proceed through the offseason. We hoped you liked reading A Preliminary Look at the Arbitration Market by Jack Moore! So should Kenny Williams get the Blame for the Bobby Jenks deal?